The age of using inflexible and environmental polluting energy is coming to an end. The trend is moving towards the use of more efficient renewable energy, and top global companies are spearheading the move. Not so surprising since these businesses are the major energy consumers in the world. Companies like Microsoft, Pearson, and Google are already 100% powered by renewable energy, while other corporations like Walmart and eBay are making giant strategic steps toward full sustainability. Google, for one, is known to be the largest corporate buyer of renewable power, consuming 3 gigawatts of solar and wind. And, there being a lot of green to be made from a sustainable powered economy, other brands are on the mission to do the same. Right now, British Land is at 98% in using renewable power at its shopping destinations and offices. By 2019, it plans to have switched the remaining 2% to renewable power use. 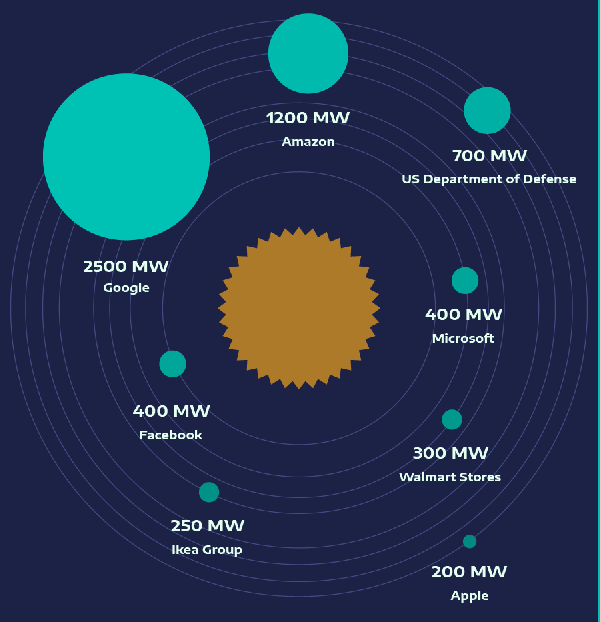 Most brands like Walmart which unbelievably beats the US Department of Energy in annual renewable power use, Coca-Cola, Swiss Re, and Ikea plan to be 100% powered by renewables by 2020. These companies plan to achieve this goal by using mostly wind and solar power, which is projected to be the world’s main source of energy by 2050. With global warming continuing to be a major concern, these changes are quite timely. The more these world known companies use renewable energy, the less greenhouse gas emissions that cause climate change are released into the air. The fact that the sources of renewable electricity can never be depleted or run out is another plus. Also, the cost competitiveness of solar and wind power with fossil fuels has further influenced this move. An estimate of 85% of the world’s power supply to be coming from renewable energy in 2050 shows that the world is moving in the right direction. Not only are these companies saving themselves, but all mankind in the process.